I grew up adoring my Mother for her tender love and care for us. She and my Father raised their nine children with great love and pride. They did not give up on each other despite of life's challenges. 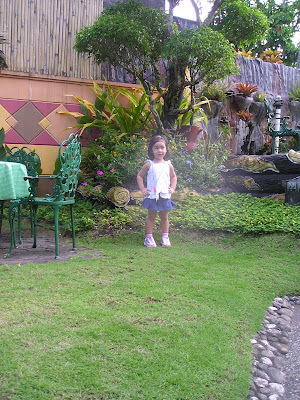 Mama taught me to do household chores at a very young age because I was the eldest daughter among her kids. I am always fond of the memories of me and Mama doing our laundry in the river nearby our house. I would always remember that precious moment that we did together as I was growing up. I think what made that bonding so special is that, nobody does their laundry in the river anymore in this modern day. 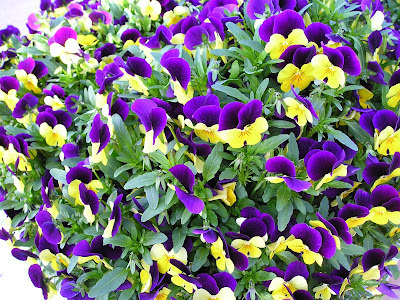 This Mother's day, I would like to make her feel extra special by sending her flowers. It is not impossible to buy flowers online and deliver it to the very special someone in your life, especially your one and only MOM! I don't think Mama receive any flower from us yet, so this will be a very special one for her and I want to surprise her with something different and lovely this time. To you Mama, I hope that through the flowers that I will send you, you would be able to feel how much I love and miss you! May God always take care of you so that we will have more time to be together with your grandchildren. We may not have the luxurious materials in the world, but your love and compassion will remain in my heart forever, I love you! 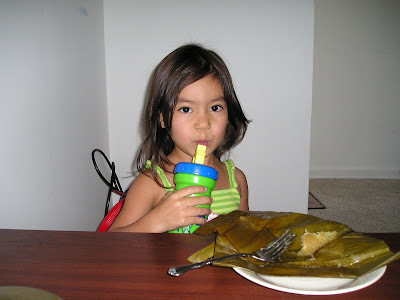 I found a suman from the commisary the other day and I thought of trying it. 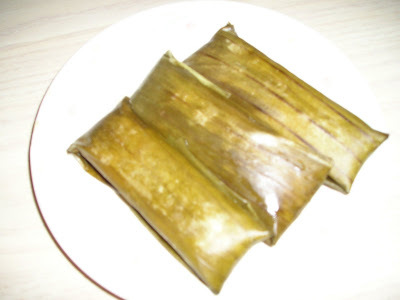 Suman is a type of dessert in the Philippines that is made from cassava. I thought it won't be good but I was surprised that it was. 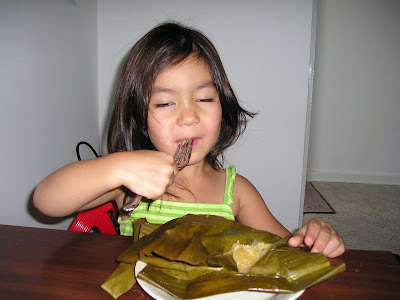 It's my daughter's first time of trying suman but she ate two rolls of it. Even EJ ate some although he wasn't very fond of it. One pack has four rolls and it only cost $.66, not so bad at all.. 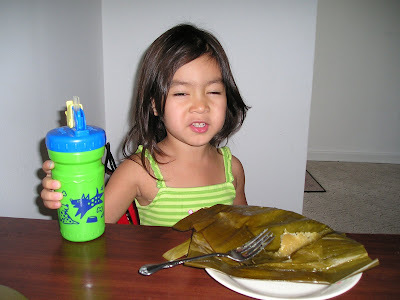 Here's my daughter's facial expressionswhile eating it hehehe.. She just woke up when I offered it to her. 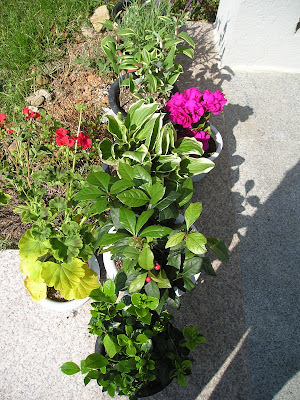 We got our free ornamental plants for this year. Although the selection were not as good as last year's I can't complain because it's FREE lol.. 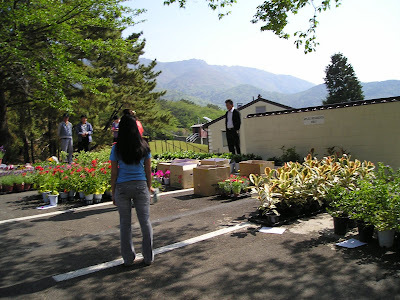 But anyhow, here are the assortments of the flowers... That's me standing there, deciding which one to get lol.. Here are the ones that we took. 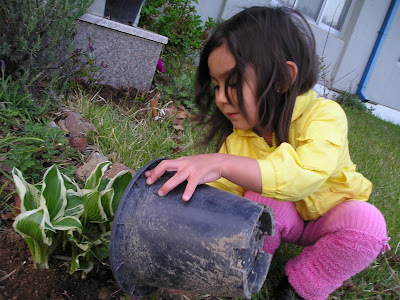 And here is my every helpful daughter Rylie eagerly planting! She is our Busy Beaver... Have a good night everyone.. My eyes are closing now.... See you tomorrow. I want to Color my World! 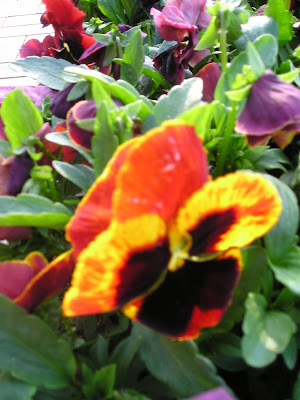 One of my favorite hobby is gardening because I love flowers and the smell of plants relaxes me. Even on things inside our house, I like something that is in floral design like our plates, curtains, seat covers, blankets and even wall art. When we bought our house, the former owner was very kind to leave us her wall decorations but it is kind of old already so I asked my husband if we can buy some replacement for it. Below are some of the wall decors that we bought when we were in Korea. 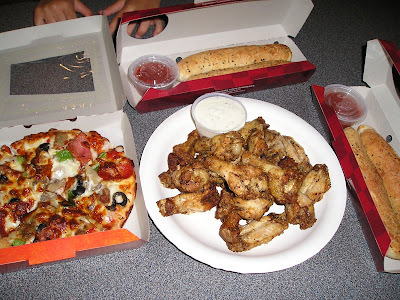 Friday Night is called Wing night in my family hehehe.. Why, are you curious? It's because every Friday, they sell chicken wings at Duffy's for 10 cents ($.10) each only. So for 20 pieces you only pay 2 bucks. Pretty good deal isn't it. 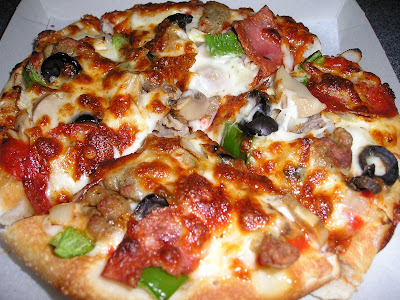 But since I can't eat chicken anymore (I'm allergic), i just munch on their pizza. EJ love the bread sticks... John and Rye love everything lol..
Alright, enjoy the feast hehehe.. This video that was originally composed, sung, and recorded by Steven Curtis Chapman is one of our favorite songs. This guy from the academy, Phillip Mills, does a really good job in singing the song too. Play the music video guys and tell me what you think. First of all, I would like to thank everyone who visited yesterday. 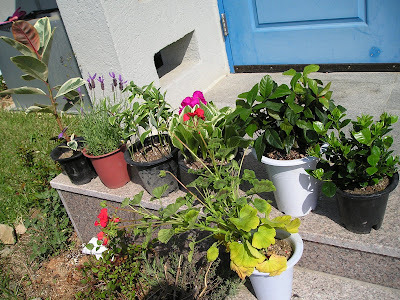 I wasn't able to visit any one's blog yesterday because I was so busy. Thank you also for those who included me in their prayers because it made me well. As soon as we woke up yesterday, we got ready to go to the hospital. I was asked to give a urine sample and the doctor examine my back and lower stomach, he tapped it and asked me if it hurts but it doesn't. So he gave me a septra antibiotic to take for five days. 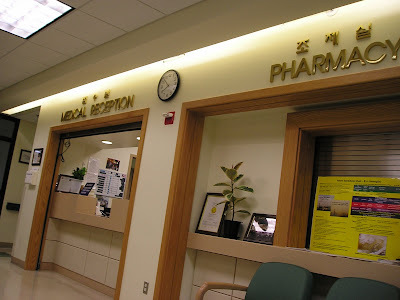 They didn't call me about the urine test so I am hoping that there's nothing serious about my health. While I was being examined my sweethearts played at the play area of the hospital. Thank you once again guys! 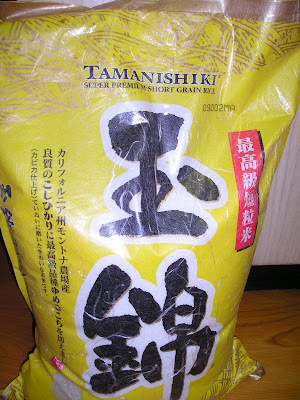 When we arrived here a year ago, the price of this bag of rice is only 16 dollars and something, but now it cost $23+ already. Can you believe that? Everything is going up but me hehehe. Kidding aside, I am just wondering how other families who don't have fix income can survive economic downturn. We are not rich so wise budgeting is very important to us. How about you? When I first moved in the States, my husband and I lived for over a year at my father-in-law's house. 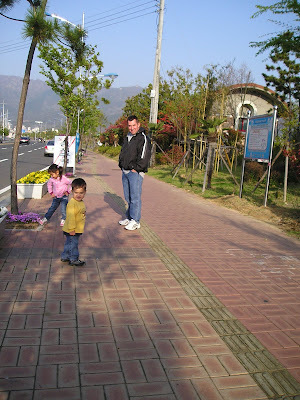 We lived there for the main reason of helping him recuperate from my mother-in-law's death. 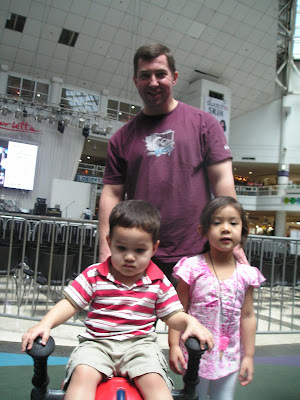 My husband siblings were very happy because Dad went back to his healthy lifestyle again. With that progress, my husband and I decided to buy our own home. Finding a home is very difficult, you have to have a good real agent that knows the area quite well and a reputable realtor. Thanks God, He provided us with a very helpful real agent who helped us through out the process. 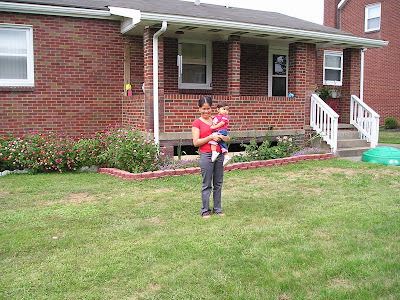 The picture below was taken two years ago at the back of our house in West Virginia. Oh I miss our home so badly, can't wait till we go back there in December. 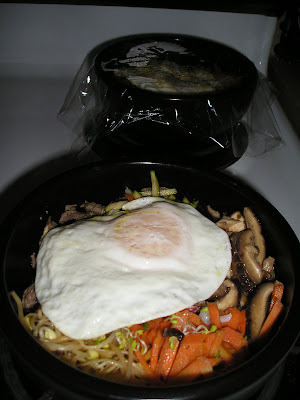 "Bibimbap is delicious, gorgeous on the plate, and easily tweaked for different palates and spice levels. I've included 6 vegetables in this recipe, but you can easily make it with just 3 or 4 or what you happen to have in your fridge. Koreans usually eat this rice dish with some beef, but I usually top mine with just an egg fried sunny side-up." Preparation: 1. Cook rice in rice cooker or on the stove. 2. Give cucumber strips a saltwater bath for 20 minutes and then drain. 3. Season spinach with 2 tsp sesame oil, 1 tsp salt, and a dash of sesame seeds. 4. Season bean sprouts with 2 tsp sesame oil, 1 tsp salt, and a dash of sesame seeds. 5. Sauté carrots with a dash of salt. 6. Sauté mushrooms with a dash of salt. 7. Sauté zucchini with a dash of salt. 8. Place cooked rice in large bowl and arrange vegetables on top. 9. If desired, beef or egg can be placed in the center. 10. Serve each with small bowls of red pepper paste (kochujang) and sesame oil. 11. To eat, add a small amount of oil and desired amount of red pepper paste to your bowl and mix everything together with a spoon. So here you go Ate Cecille, enjoy.. Don't forget to leave me some okay lol..
My husband told me last Sunday after we ate our favorite Korean dish "We should start making our own Bibimbap, since we like it so much." I said "okay." Well the other day, our Filipino neighbor called me up on the phone and asked me if we like Bibimbap. "Very much," I said. So she made and gave us two bowls, she said that her husband don't like it so she's the only one who eat it. It was actually pretty good, it tasted just like the real Korean Bibimbap. She made a lot so she gave me some. 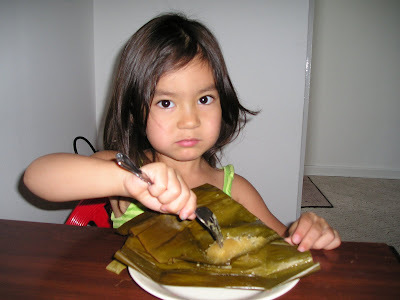 Thanks ate Lelet, you're the best chef around! The title is Bulgogi Bibimbap because this one that she made has meat on it. The one we always eat in town do not have meat. So do you guys have a neighbor like mine? When I woke up yesterday and use the bathroom, I felt a burning sensation when I peed (urinated). It was bearable though, so when hubby told me that he was going to bring me to medical, I immediately said NO!" I hate hospital. But today the pain was unbearable and at the end of my pee, the last drops are BLOOD! I was alarmed! So I told hubby about it. Of course he said "See." Okay I am stubborn, hard head or whatever you want to call me, but as long as I can still bear the pain, I don't mind. But anyhow, I will try to go to the hospital tomorrow, so please include me in your prayers guys. Thanks a lot and good night! I was blog hopping a while ago and I saw the recent post at Kevin's blog about this video that made me cry while I was watching it. This is a reality that I always tell my kids whenever they do not want to eat. This is also a very good reminder that we have to be contented and thankful for everything that we have. Even the things that we have is not exactly the ones that we want but still we are fortunate that at least we have something, other's DON'T have anything. Please watch the video guys! 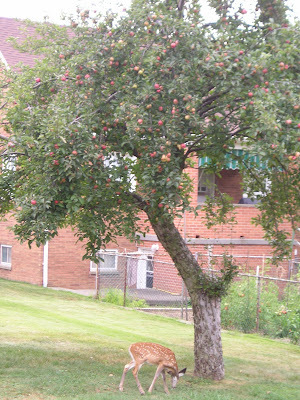 We used to have two or three visitors in our backyard during summer. 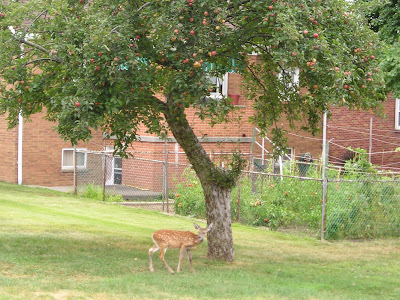 They are the family of deers that lives nearby our house back in the mainland and we enjoy ourselves watching them eat the apple fruit that fall on the ground from our backyard. 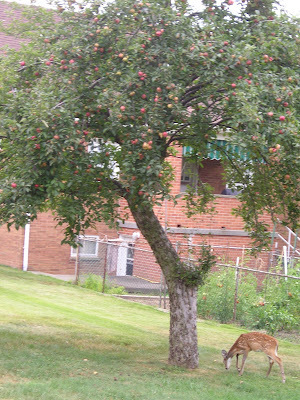 This apple tree bears so many fruit every year and our neighbor would come out to our yard and pick 'em and make it into an apple pie since I don't know how to make one hehehe. She makes awesome homemade apple pie. 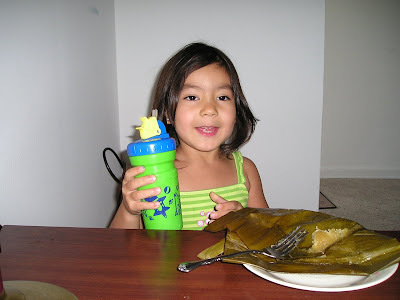 Me and my daughter love eating the fruit because they are sweet although small in size. 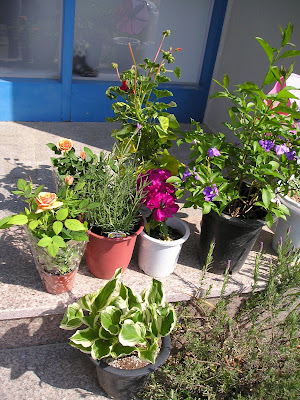 Yeah, it is obvious on my post that I am missing our home... sigh... The good thing is that we are near to my homeland Philippines, so the air fare for the four of us will be much cheaper compared to the states. 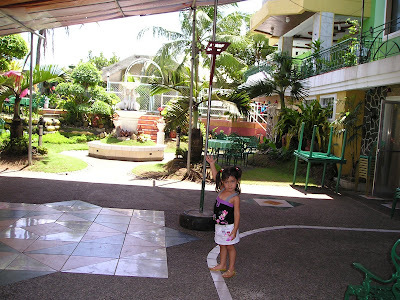 When we were in Legazpi, we stayed to a small family owned hotel. 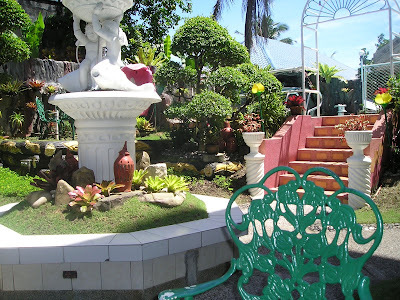 what we Like about Jennifer's Kabayan Hotel is that all the employees are very friendly and welcoming except to one lady. I think she is a manager or something but the majority were pretty nice, even the owner always talks to us when we're outside. The ambiance is awesome, they have a terrace where you can sit and relax, a swimming pool to plunge in when you're feeling hot or sit in the beautifully landscaped garden. it's a very nice place to stay especially when you have kids. The price is unbeatable too compared to other hotels in the area. Beautiful isn't it? This park used to be an abandoned lot near the road where we always drive by in town. 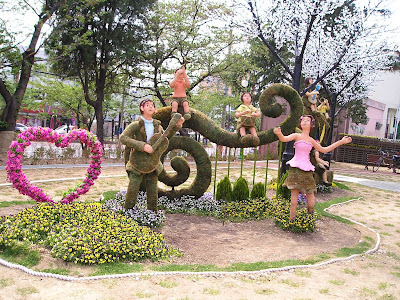 During the cherry blossom festival, they landscaped it into this very pretty park. What amazes me is the material they used, it looks like a dried grass. I don't know what it's called but its very pretty. If you want to see more pictures please click here where I posted the rest. Thanks! We did our family walk by the beach yesterday but it was cold out there that we didn't stay very long. 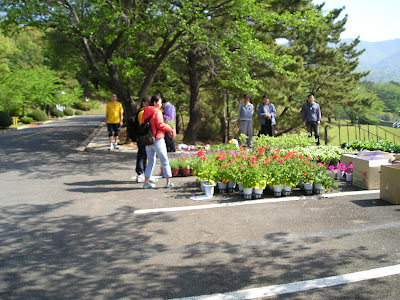 Before going back to the base, I took some pictures of the flowers beside the road. 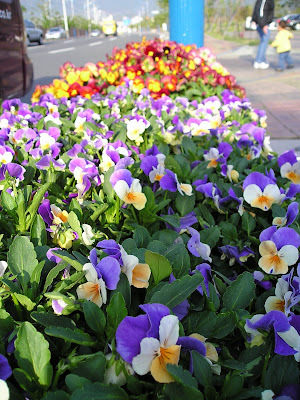 Here are some of the assortment of the gorgeous flowers on the flower beds. 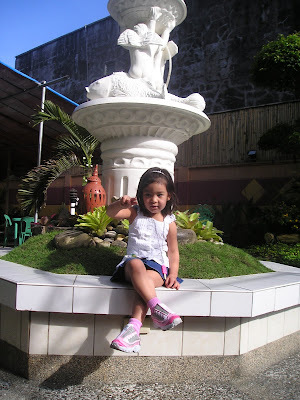 Here's my sweethearts goofing around hehehe.. We ended up playing on the playground area of the school inside the base. 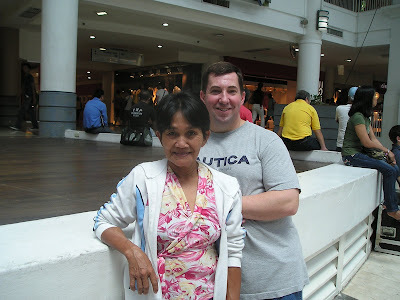 EJ made some progress when we went to the Philippines. 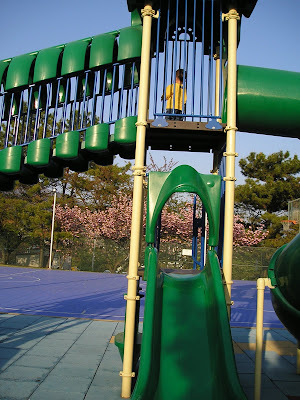 He can climb to this tall slide by himself, he never did it before because he's afraid. But now, he can jam through it.. And we end up our bonding with some chicken wings and Pizza at Duffy's. 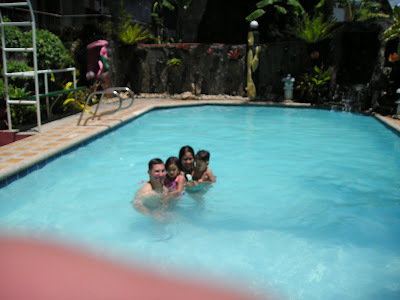 We stayed for a couple of days in Manila before proceeding to Bicol during our vacation. Mama, my brothers Rick and Nick, and my sister Lyn with her husband and daughter stayed with us at the Oxford Hotel the night we arrived. 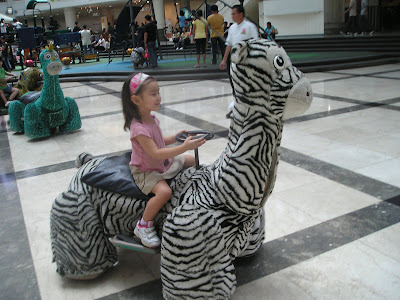 The next day we went to the Glorieta Mall and did some shopping and we stopped by at the playstation area for the kids. 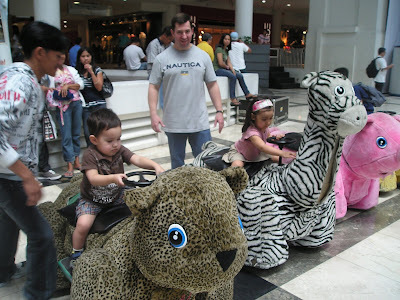 The kids had a lot of fun riding on the electric powered animals. 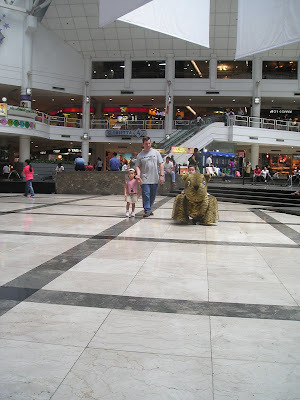 The tokens are 20 pesos each which last for about 10 minutes and you have to reload again. 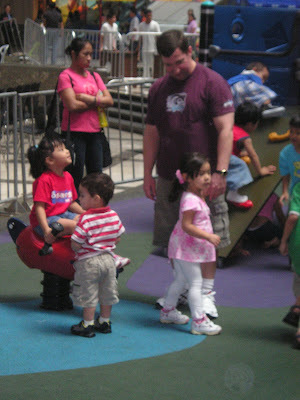 The play area is pretty big, spaceous for the kids to roam around. Here's Rylie, having fun driving around. John and Mama hanging out while watching the kids. 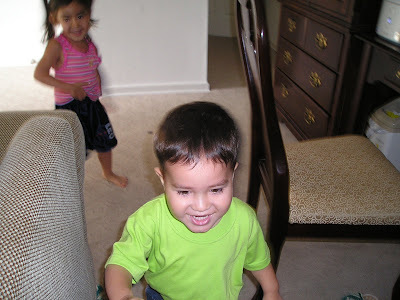 Here's my brother Nick and Rylie. She was telling him to go down because she wants to drive alone heheh. 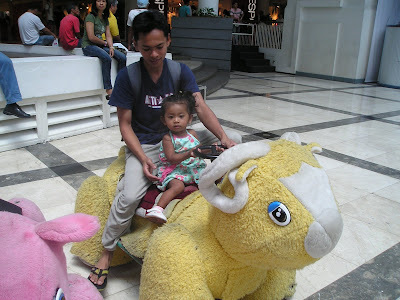 Here's my brother-in-law Jerwin with my 18 months old niece Justine. My brother Rick assisting EJ on his ride. 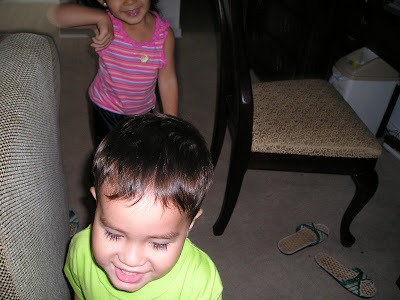 These two last pics were taken on the next day, Rylie wanted to go back there and play. 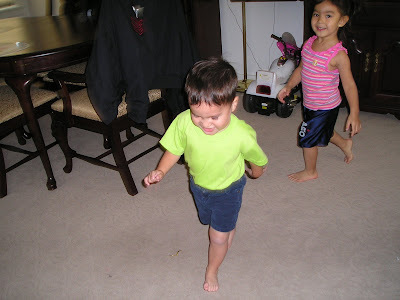 Chasing each other is a fun-filled activity that my angels love to do everyday. They never get tired of doing that. 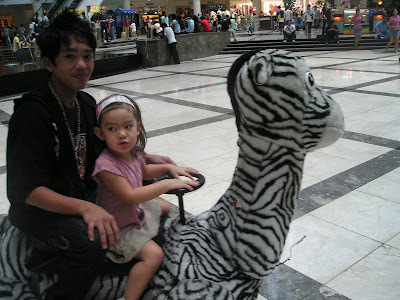 Whenever hubby is at home, our house is filled with screaming from the kids. 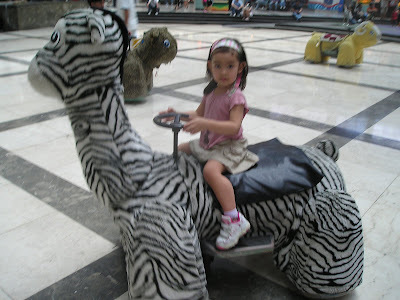 But when hubby is at work, I am the one that do the chasing hehehe.